Doom changed the face of video games upon its release. It invented the "first person shooter" genre, the ultraviolent and ultrapopular type of game where the view is such that it looks like the player is holding the weapon in the game. This is better than other recent adaptations like Alone in the Dark and House of the Dead. The interesting fact about this is that unlike the other (worse) movies, Doom had virtually no story. The player was a marine stuck on Mars, and had to find a bunch of keys and kill a bunch of things. This may be why the movie does better than some of its peers - the filmmakers could craft a story around the basic premise of the game. Still, Doom is not much of a movie, but at least it does not actively annoy the person watching. Basically, the film, like the game, is mindless violence. Oh there is a plot, but most of it is useless. Screenwriters David Callaham and Wesley Strick (The Glass House, Return to Paradise) actually try to put in most backstory than necessary, or than people will care about. The basic premise is that there are problems on a research facility on Mars. Marines go in to rescue the scientists and retrieve data, but all hell breaks loose while they are there. Everything else is superfluous. The Rock (Be Cool, Walking Tall) is the Sarge, and is in charge of the Marines. 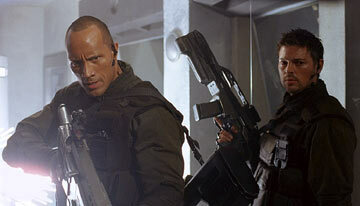 The only other guy worth remembering is Grimm (Karl Urban, The Bourne Supremacy, The Chronicles of Riddick). Grimm's parents died on a Martian archeological dig years ago. His twin sister Samantha (Rosamund Pike, Die Another Day) now works at the very same facility, straining their relationship. Then, the story goes into the mysterious research at the facility, prehistoric martians, and some other random stuff. Again, it's a lot of backstory that does flesh Doom out relative to other genre films, but in the end, most of it is worthless. It's all about killing monsters, and that's what the film degenerates into. Director Andrej Bartkowiak (Cradle 2 the Grave, Exit Wounds) does a decent job of retaining elements of the game like the various weapons (chain gun, machine gun, chainsaw, and the ever-popular "BFG"). He falters with a sequence near the end that replicates the actual game. One of the marines wanders the halls, and the film is shot from the first person perspective. It sounds a lot more exciting on paper. It's too bad that the monsters are not very scary, and the Rock does a lot worse than he usually is. Most of the time, he's yelling and bug-eyed. Often it looks like his eyes are getting ready to pop out of their sockets. The overall effect is one of comedy. Thus, Bartkowiak goes the typical route and kills off the marines one by one. One thing that is never clear is whether they are military officers or paid security. The Rock constantly screams about duty, then screams about pay. Then he screams about his bug-eyes. Or not. The rest of the film is frustrating. First, the story takes a surprisingly sinister turn, forcing the characters to think and make some hard choices, things rare in this type of film. Then, Bartkowiak opts for a lame twist, and a lamer ending. 1 hour, 40 minutes, Rated R for strong violence/gore and language.